Wow! Where did the time go? 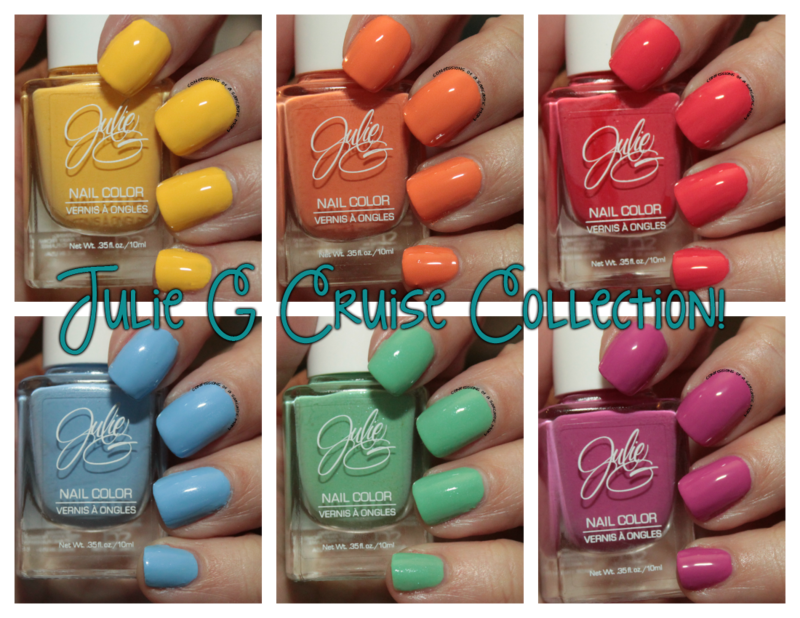 I bought this collection, the Julie G Cruise Collection, when it was first released, and I never posted it! It's a six-piece set of gorgeous shades, and they are perfect for spring! I am a big fan of Julie G polishes, and I own several. Let's start with Canary Island, a gorgeous yellow creme. Amazing formula for a yellow! No issues, and it is completey opaque in two coats. I love yellows that have a good formula! You know me and orange-esque polishes, so you know Old San Juan would be a favorite! The formula on this one is good - two coats for what's pictured. The first coat was a little streaky, but it evened out with the second coat. We all know I'm not much of a fan of pink - but Miami Beach is very pretty! It's got a coral-y vibe, but leans pink. The formula on this one is spectacular - best of this collection. It could have been a one-coater, but I used two for good measure. I love Santorini! A gorgeous light shimmer runs through this light, bright blue. It is very unique, and I don't think I have anything like it in my polish collection. I just love the color, and the formula is good. I have worn this one several times since I purchased it. Next up is Tahiti! It's a gorgeous light green with the subtlest of shimmers! This soft green is a little tempermental, but the second coat evens out. This sort of leans a little on the mint side, but is still a true green. Last, but not least, is Rio De Janiero. It's a bright orchid-esque purple with a great formula and wonderful shine. I didn't have any issues with this polish, and like Santorini, I've worn it several times since I purchased it. You can get this set, and many other great Julie G and Jesse's Girl products at Rite Aid or on the website. I'm a HUGE fan of Jesse's Girl Cosmetics - I've even met Jesse! I own and use a lot of polish and makeup from this company. From polish to eyeshadows, lipsticks to brushes, I recommend them to everyone!